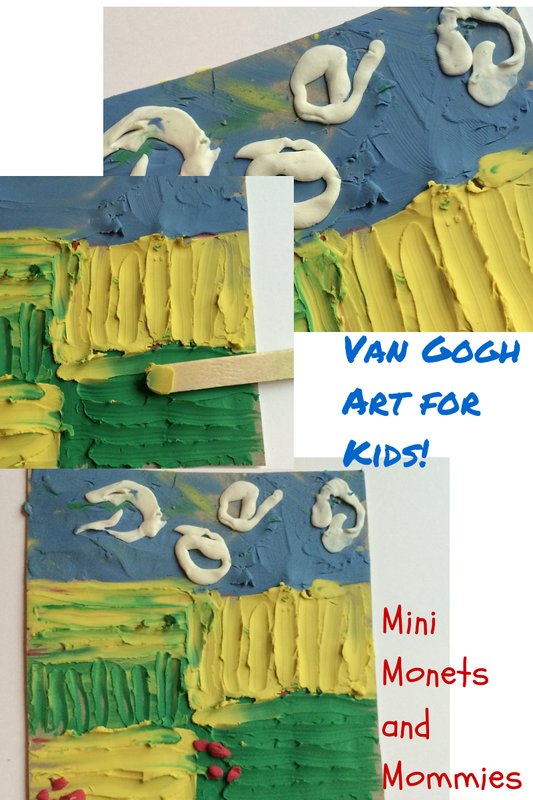 Google Van Gogh art projects for kids and you’ll get a lengthy list of activities that focus on Starry Night. Hey, it’s not that I don’t thoroughly enjoy this piece of art. Just hearing the name makes me think of the cute chem teacher in tenth grade singing the Don McLean song about Vincent at the student-teacher talent show. But, it’s hardly Van Gogh’s only painting. One of my favorites from this famous artist is The Plain of Auvers or Wheat Field After the Rain. During my years of teaching kids in an art museum, I was lucky enough to have the real thing hanging in the gallery to use. 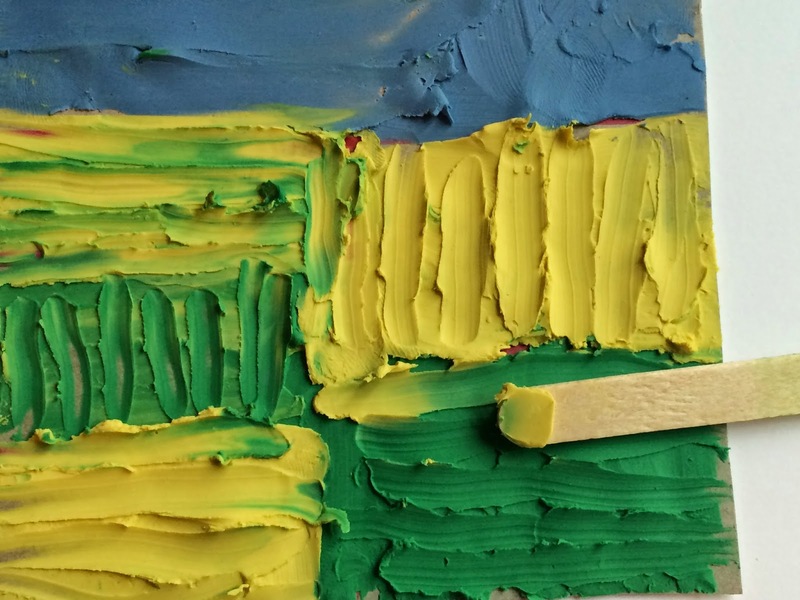 I don’t know if it’s the simple wheat fields, the uber-obvious brush strokes, the swirling clouds or the almost geometric patchwork landscape, but young children respond very well to this artwork. Whenever I took a group of 4- and 5-year-olds to look at this piece, they always stared intently (or at least as intently as a preschooler can) and talked at length about it. So, before you start the art-making with your child, take a gander at the painting and discuss what your little artist sees. Even though you might not have the real thing at your disposal, you can look at a reproduction poster. An art book or visit the Carnegie Museum of Art’s website for a picture and some background on the piece. · Where do you think this is? Why? · How do you think Van Gogh made this? · Tell me about the colors that you see. Now, let’s get to the art activity. 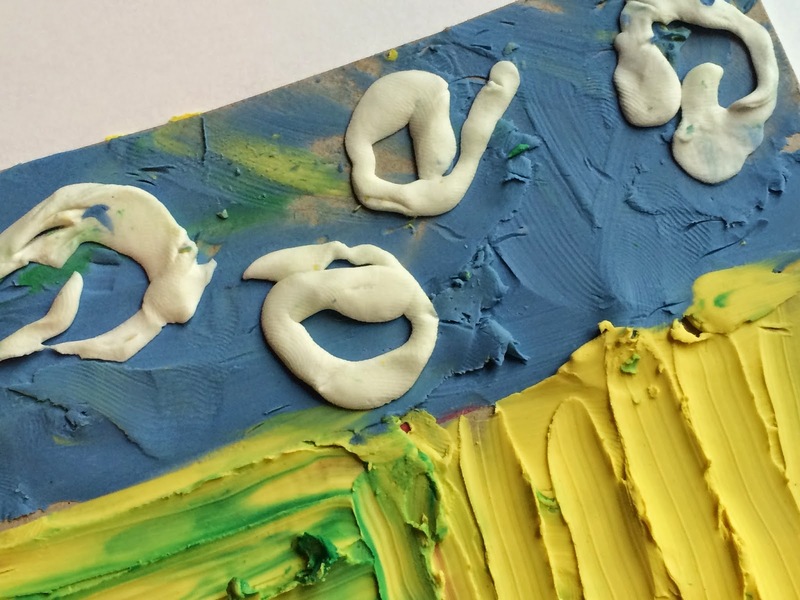 · Modeling clay-- You’ll need colors that match the painting (blue, white, yellow and green). · Cardboard – Cut the front off of a cereal or cracker box instead of buying a sheet. 1. 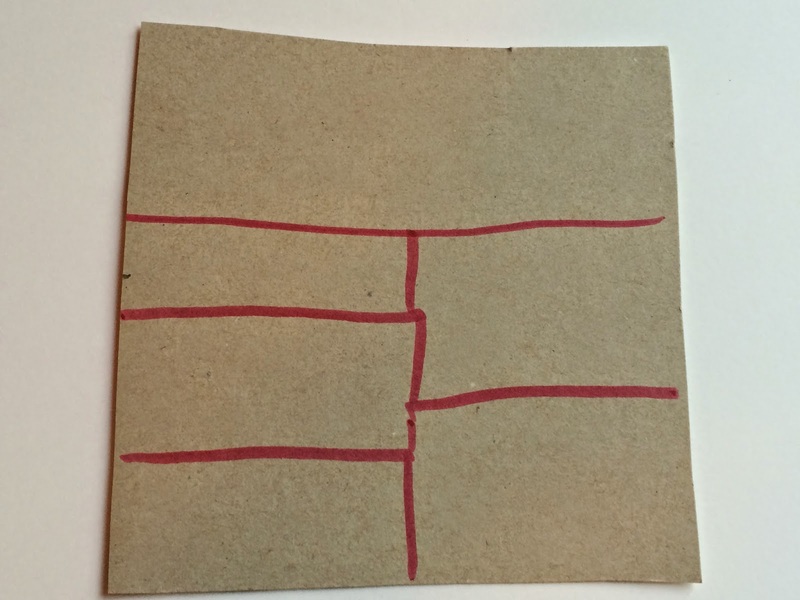 Cut the cardboard into a rectangle. I sized it to roughly 5x7 inches, but you can choose your own. 2. Have your child draw what he sees in the real artwork (or reproduction) onto the cardboard with a pencil or marker. Add in some artsy vocabulary such as horizon line (explain it as the line that divides the ground and the sky). Don’t worry if your child’s drawing looks very basic. The simpler, the better. He can draw a patchwork of squares and rectangles. 3. Tear apart the clay into quarter-sized pieces. 4. Your child can spread out or “finger paint” with the clay, creating different patches of grass and wheat fields, and a sky. 5. Add some more texture. Your child can drag the craft stick over the clay, creating brush stroke-like patterns. 6. Use white clay to add clouds. Have your child swirl the clay in the blue sky with his hands. Are you looking for more famous artist projects? Check out and follow my Pinterest board for some more ideas! I'll be sure to start saving our cereal boxes for this craft - it's going to be perfect when it's too hot to get outside! The pieces or of art really look alive. This is a very creative arts idea. I might try the idea for one of our summer at home activities. Thank you very much for sharing. I love it a lot. The texture is great. 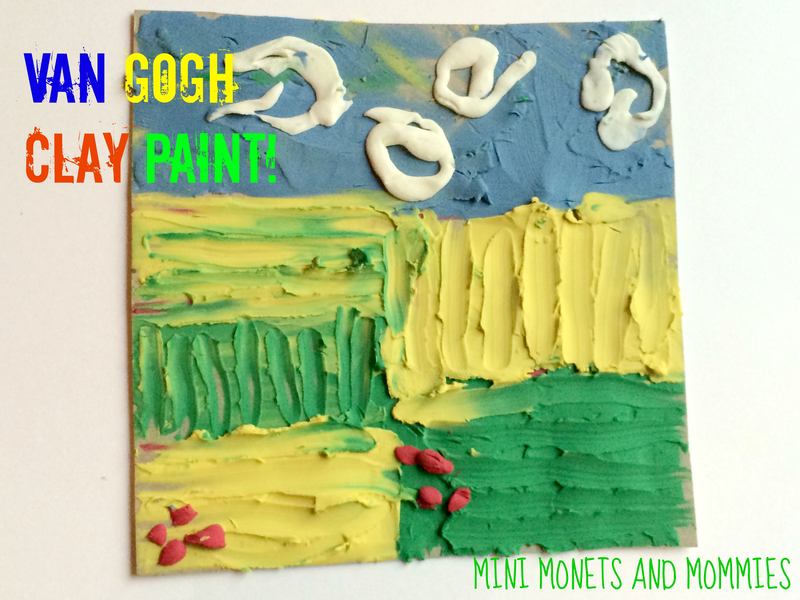 Doing the "finger painting" with clay process is helpful for teaching kids about texture. It's like their fingers become the brush. Oh, how fun!! I love it. Thank you for sharing at Sharing Saturday! !